Whether you’re preparing Thanksgiving dinner or whipping up a batch of biscuits and gravy for dinner, learning how to make gravy from scratch is the way to get the most from your whole poultry and beef purchases. Even better, it’s not hard to master homemade gravy. 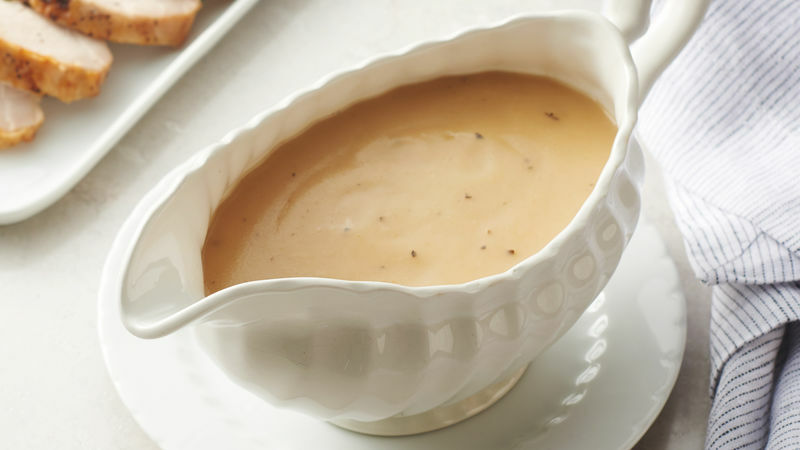 Keep reading to learn how to make gravy from drippings, how to make gravy from a roast and more tips for perfectly smooth and rich gravy. 1. Pour turkey drippings (the fat and juices from your roasted turkey) from the roasting pan into a bowl, leaving the brown particles in the pan. Measure out 1/4 cup of the drippings and return them to the roasting pan. 2. Sprinkle 1/4 cup of flour into the pan and cook over medium heat. 3. Stir constantly until mixture is smooth and bubbly. 4. Pour in broth and heat to boiling, stirring constantly. Boil and stir 1 minute. 5. Add salt and pepper and stir until incorporated. Want a little more instruction before getting started? Watch this helpful tutorial from the Betty Crocker Kitchens. If you have homemade chicken stock, beef stock or turkey stock, homemade gravy is even easier. If you don’t have homemade on hand, you can still make a quick gravy, just follow the recipe below using store-bought chicken, turkey or beef stock or broth. If you’ve got a whole chicken or turkey on hand, make giblets into gravy using the recipe below, which combines super flavorful drippings with a giblet broth. It’s easy making gravy with these tips. Your wire whisk is the best way to avoid lumps. Measure accurately — too little fat and your gravy will be lumpy, but too much fat and your gravy will separate. More drippings means more gravy! Just double or triple your recipe. Taste your drippings before your make gravy. The drippings can get burnt, make sure they taste good before putting any effort into making gravy. Remember, you can always use broth or stock instead of drippings. Quick-mixing flours, like Wondra, are miracle workers when it comes to gravy. Because the flour is very fine, it blends easily making your gravy smooth and creamy. With recipes as simple as gravy, it’s important to get the details right. Sometimes that can be harder than expected, but have no fear, Betty is here to fix all your gravy problems. How to Fix Thick Gravy? Add a hot liquid — either stock or broth, water from cooking potatoes, white wine or just plain old water – to hot gravy and whisk to incorporate. Note, when you wish to make a thinner gravy from the start, follow the Pan Gravy recipe and decrease meat drippings and flour to 1 tablespoon each. How to Fix Thin Gravy? Dissolve 1 tablespoon of flour in 2 tablespoons water; stir into gravy with fork or wire whisk. Boil and stir 1 minute. Alternately, you can add a quick-mixing flour, like Wondra to thicken gravy. What to Do When Gravy Is Too Salty? Add a few peeled potatoes, cut into eighths; cook and stir 5 to 10 minutes, then remove potato pieces. What to Do When Gravy Is Lumpy? Pour into food processor — or if you have an immersion blender, this is the perfect time to use it — and process until smooth, or press gravy through a strainer; return saucepan to heat. Note, you can avoid lumpy gravy in the first place by using a wire whisk when adding the flour to the drippings. Beat the drippings rapidly with the whisk while adding the flour and voila! No lumps. What to Do When Gravy Separates? Gravy separates when there is too much fat in relation to the other ingredients. If this happens, cool down the gravy until the fat rises and solidifies. Scrape off the fat, discard and reheat your gravy. A gravy separator can also come in handy in this situation. When you use a gravy separator, the fat will sit on top and a spout will pour the liquid from below. Pour until the fat remains; discard the fat. Alternately, adding a higher proportion of other ingredients can help when there is too much fat. Blend equal amounts softened butter and flour, or Wondra together in a small bowl, starting with a couple tablespoons of each. Once the flour and butter are blended together, reheat your gravy and whisk in flour-butter mixture, a little at a time. What to do When Gravy Tastes Like Flour? If your gravy tastes like flour, it’s probably because you did not allow it to come to a full boil. It’s important to cook gravy at a full boil for 1 minute. This cooks the flour or cornstarch, so the gravy doesn’t have a starchy flavor. To correct, bring gravy to a boil; reduce heat and let simmer 1 minute. If gravy is too thick, then thin as noted above. How to Fix Bland Gravy? Those bits in the bottom of a roasting pan are flavor jewels! Be sure to scrape them all up to start your gravy. You can always strain it later if you like smooth gravy. Adding a little chicken base or beef base, depending on the type of gravy, will intensify the flavor, but will also add more saltiness, so it’s best to adjust the salt level once you have added other ingredients. Ground pepper, finely chopped fresh herbs also can add flavor. If possible, make gravy ahead of time. It will develop a deeper flavor, and it’s easy to remove excess fat. Roux is a classic sauce every home cook should master. It’s used to thicken and it adds richness. It’s just what you need to thicken a too-thin gravy! Here’s how to make it: A mixture of flour and fat (usually butter) is cooked over low to medium heat until smooth and bubbly and then liquid is added. Some recipes call for cooking the roux until it turns golden to deep brown. Making a roux cooks the flour and prevents foods from taking on a raw flour taste. Note, roux is similar to a béchamel or white sauce. The only difference is that a dairy product, like milk, half and half or cream is the liquid added. Gravy will keep in the fridge for up to two days. Store in a well-sealed jar or container. It can be tricky to warm gravy in the microwave, since it’s easy to overcook and curdle the gravy. Instead, reheat gravy on the stove over low heat. Stir often and remove from heat once gravy comes to a simmer. If you’d like to save your gravy for long than two days, store in a well-sealed container or resealable plastic bag in the freezer. Frozen gravy will keep for up to four months. One caveat, milk- and cream-based gravies will separate when reheated, so it’s best to turn these types of gravies into your next meal, instead of freezing. What’s next on your list of classic recipes to master? Betty’s got how-to articles on how to make mashed potatoes, how to make apple pie and everything in between!